It’s hard to find much fault with these because for their price, they really are very good. They don’t make any spurious claims to magical ceramic infusions that will somehow give you the hair of a goddess and instead simply leave you with beautifully straight hair in a surprisingly short amount of time. For long and thick hair, I think these wide plated straighteners will be a huge blessing. They deal with it so much faster than narrow versions, even narrower GHDs. They look good and work well and if you’re looking for straighteners in this price range specifically with wide plates then I’d definitely recommend these. After becoming widely known as a successful firearms manufacturer, Remington grew its company and diversified into other industries such a personal care appliances. From 1937 onwards, Remington put a lot of effort into becoming a widely trusted and affordable household brand name. While at the lower spectrum of price, the quality is usually reasonable and they tend to create very acceptable hair straighteners. Considering Remington can have a tendency to produce fairly run of the mill products, I’m really impressed with these. Compared to the GHD wide plated straighteners, these are actually a much sleeker design and look really good. For those with very long hair or thick hair, while narrow plate straighteners take ages to get through it all, these breeze through much more effectively. They straighten flawlessly on one or two runs through and the result survives a full day of walking about and then sleeping. The hair slides through the plates easily and smoothly without nicks or snatches and the plates heat up in 15 seconds which is a nice touch as Remington’s straighteners can frequently take longer than that. It also features various heat settings with a top setting of 230 degree, which should be good for even the most unruly hair. Remington say they have improved the ceramic coating on these plates and they do approach the quality of GHDs now. Hair is sleek and runs very easily through them. They also claim that this improvement makes the straighteners longer lasting which is always good news, although doesn’t say much for the earlier models. Longevity is always important when it comes to buying this kind of thing, what’s the point in doing research only to have to do it all over again months down the line? With a three year guarantee, these don’t seem bad although many other brands offer 5 year guarantees, including GHD. The plates can lock together when not in use which is a simple feature that I’d like to see on more brands as it’s just so useful. There’s an auto-shutoff after 60 minutes which is a common amount of time for this but I much prefer GHD’s 30 minute shutoff on their wide plate model- the IV Salon Styler. The heat resistant pouch is pretty standard and always useful and the swivel cord works well with a good length. 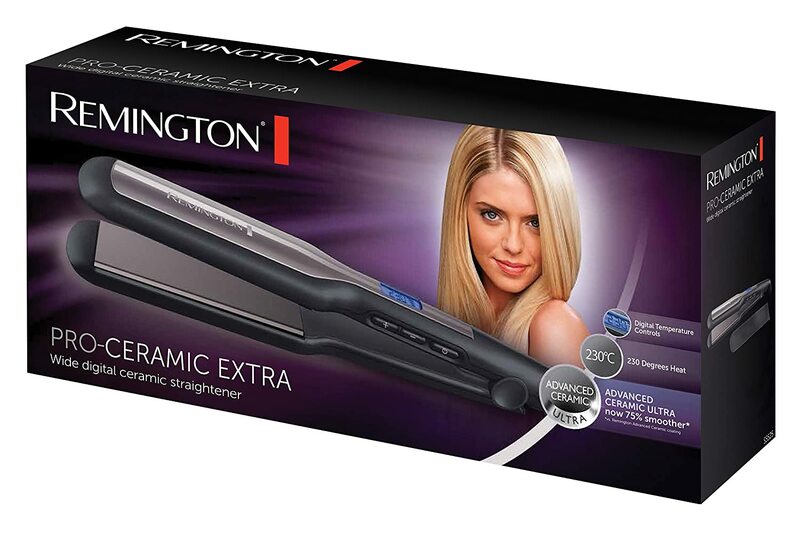 For Remington, I’d say this pair of straighteners is one of the best of theirs that I’ve seen and if you’re looking for a bargain then this could well be for you.